STOP giving away your Digital Products!! Watch this Stunning Video to see how hundreds of Professional Online Merchants are unknowingly giving away their Digital Products!! Quickly and Easily Secure your Download/Thank-you Page without using any complicated IPN or Talk-Back scripts communicating with your Payment Processor's Web Site! The above video just showed you how, through using only 2 Search Engines and a couple of very simple Search Queries, I was able to gain access to hundreds, if not thousands of Digital Products being sold online, today. This knowledge of how to obtain your products is out there, making it's rounds in popular Forums and Chat Sites. If you wish to keep selling Downloadable Digital Products online, it is absolutely essential that you take action today towards Securing your Download/Thank-you Pages! Today I'm going to tell you the easiest way I have found to get any online product for free. I found this info at one of the forums at the bottom page. Most people don't know that Alexa's search engine is different from Google's and Yahoo's. The first thing search engines usually do when they index a site is search for a robots.txt file which tells them which pages to index and which pages not to index. This is helpful to webmasters if they want to keep certain pages of their site hidden from the public, for example the download page. However Alexa does not do this. Alexa ignores the robots.txt file completely and index's the whole site. Go to google right now and type in "a charge from clickbank or CLKBANK beating adwords". Well ,well, well. Look what we have here. The first result was the download page for Beating Adwords. This little secret of Alexa has helped save me thousands of dollars which other people waste unknowingly that they can actually get it all for free. So don't waste your time at google typing in... site:http://sitename.com ...and hope to find the download page. Head over to Alexa instead and you'll be surprised how much easier it is. Absolutely shocking, isn't it. I also saw another Post, in another Forum, trying to be helpful, but in so doing they mentioned another Search Query that gave approximately 500+ results in Google for Download Pages of Downloadable Digital Products. So...The question I must ask you is this...Do you want to keep giving away your Digital Products, or do you want to secure them so that anybody wanting your products must actually purchase them? 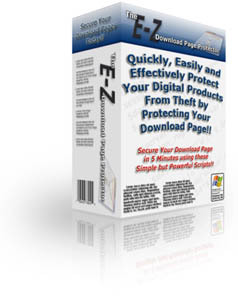 I have just created The E-Z Download Page Protector for those of you that are looking for a quick, easy, and very effective solution to securing your Product's Download/Thank-you page, (especially after seeing the above video and Forum Post). Not only that, but I am selling it at an exceptionally reasonable price so that even Merchants just starting their Online business who have a very small budget may afford it. The E-Z Download Page Protector allows you to quickly secure your Download or Thank-you page without the need for your site to communicate with your Payment Processors site, (ie: PayPal's IPN system or ClickBank's Secure Key variable). All you need in order to utilize The E-Z Download Page Protector is the simple ability to pass a Thank-you URL through your Payment processor. Something all the popular Payment Processors allow for. The E-Z Download Page Protector works with all your current or new Download/Thank-you pages. Your Download page will only be accessible to your purchaser for the amount of time you determine, it can be just until they download the product and close their browser window, (known as a Session Expiry), or they can have access to your Download/Thank-you page for any number of days you that predetermine. Not only that, your buyer will never see the URL to your actual Download/Thank-you Page. It keeps your URL hidden, but shows your Download/Thank-you page in a secure Web Page instead. You'll note that when you view the above page, you receive a Web Page Expired notice. This is exactly what your visitors, or any devious person using a search engine will see if they try and view your Download/Thank-you page without payment. Your Download/Thank-you Page will forever be secure, even if a purchaser of yours passes the URL on to a friend...Unless that other person purchases from your web site, they'll only receive the Expired Web Page notice! Secure your Thank-you page Today for only $17. And PHP, providing better protection. - (Your web hosting will need to support PHP). Risk Free Purchase! You get a 100%, 8 Week, Money Back Guarantee! 8 Week, (56 Day), 100% Satisfaction Guarantee! If you're not completely satisfied with The E-Z Download Page Protector within 8 Weeks, we'll give you a full refund, no questions asked!